Craving a classic snack? 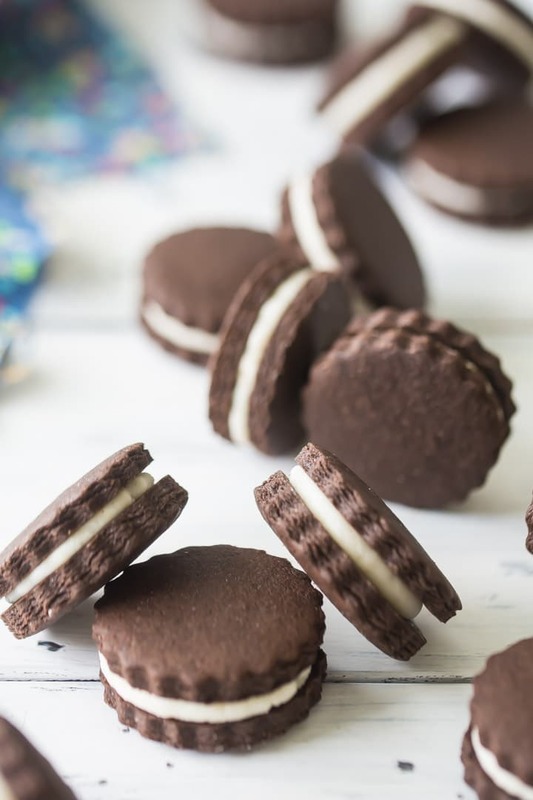 Try these homemade Oreos! 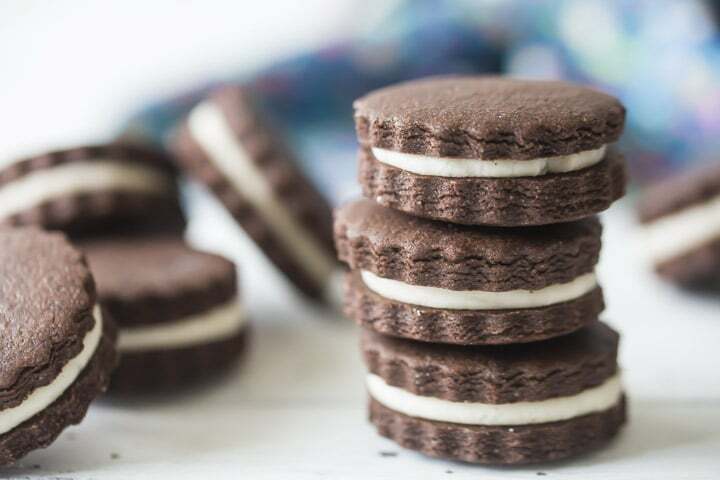 The dark chocolate cookies sandwiched around vanilla creme filling are so nostalgic! I can’t believe I’m saying this, but it’s nearly time to start thinking about back to school! The summer just goes by way too fast. Where I live, we don’t start school until the very end of August, but I know that in other parts of the country, kids are going back much earlier in the month. And when I think about back-to-school, I think about one thing: COOKIES. I love to treat my kids to fresh-baked cookies as an after-school snack. And they love it too! There’s something so nostalgic about a plate of homemade cookies and a tall glass of milk. We have lots of favorite recipes, like these soft chocolate chip cookies, these peanut butter cookies, and these oatmeal raisin cookies. But our love for homemade Oreos runs deep. WHAT ARE THE INGREDIENTS TO MAKE OREOS? The ingredients for homemade Oreos are surprisingly simple! You’ll just need butter, sugar, egg, flour, and the magic ingredient: dark cocoa powder. There’s also a little vanilla and salt added, just to balance the flavors. Dark cocoa powder is different from regular cocoa. Regular cocoa is lighter in color, and has a rich, chocolate flavor. Dark cocoa has been alkalized (or “Dutched”) so the flavor is much different. It’s a very distinctive taste, and it’s really what Oreos are all about. You can find dark cocoa powder on your regular grocery store shelf. It’s right in the baking aisle, next to the regular cocoa. 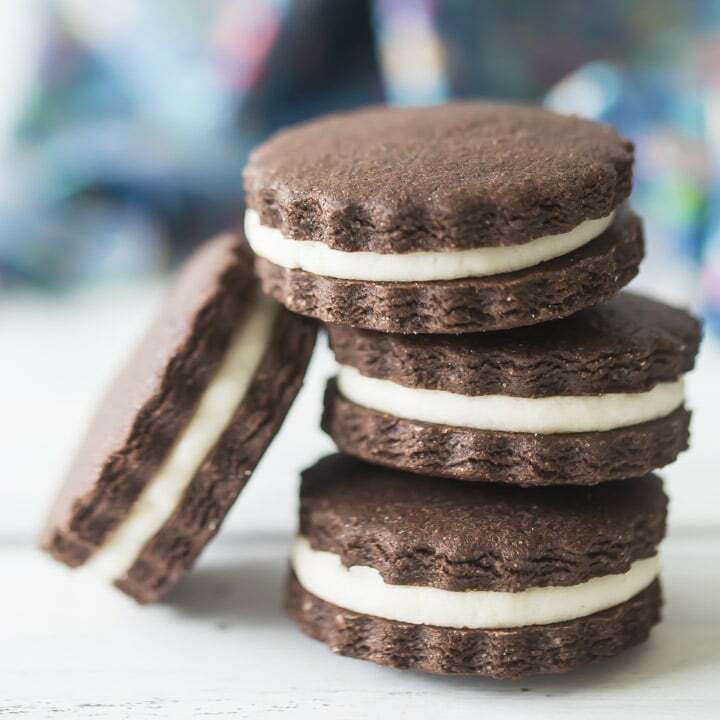 For the pictures you see here, I used Hershey’s brand, but I’ve also made these homemade Oreos with King Arthur Flour’s Black Cocoa, and it’s fantastic. 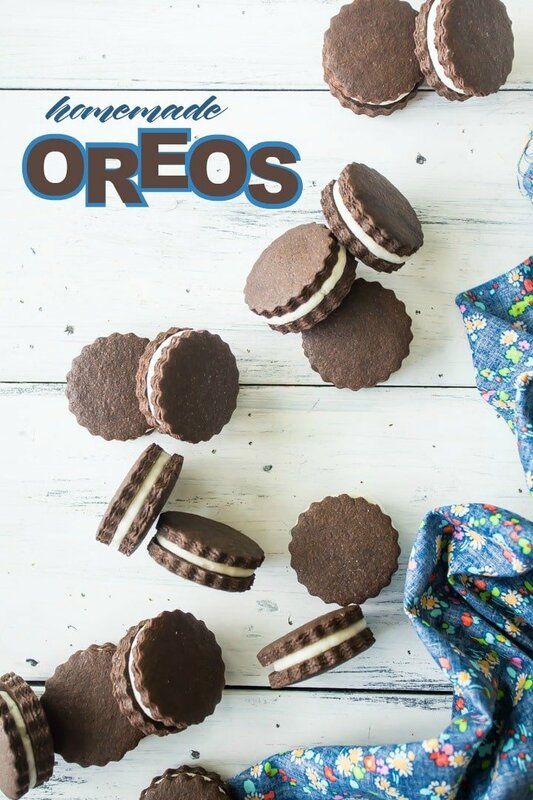 WHAT IS THE OREO FILLING MADE OUT OF? The creme filling is also really simple: it’s just powdered sugar, a little cream cheese, some vanilla, and salt. It comes out nice and thick, so you don’t have to worry about it spilling out the sides when you take a bite of a cookie! Just FYI, you don’t have to worry about refrigerating these homemade Oreos, even though the filling does have cream cheese in it. There is plenty of sugar there, so much that it inhibits the growth of microbes. It’s more like a candy than anything else. And of course candies like caramels don’t need refrigeration, even though they also have lots of dairy! HOW DO YOU MAKE HOMEMADE OREOS? To make these homemade Oreos, start with the chocolate cookies. This recipe is based off of my favorite vanilla cutout cookies. I have tons of info on that post! 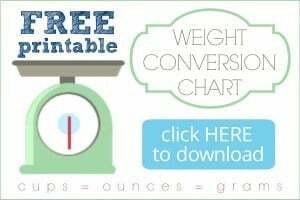 So if you’d like to know more about why it is the way it is, there’s definitely a method to my madness, and you can read all about it! Mix the butter and sugar, add in the vanilla and salt, then the egg, and finally the cocoa powder and flour. Depending on the kind of mixer you have, and the humidity levels in your area on the day you’re baking, you may need more or less flour. Add it a little at a time, mixing, and watch for the dough to gather itself into a ball. It should not feel sticky, but it shouldn’t be crumbly either. If it feels sticky, add a little more flour. It will most likely seem crumbly at first, but if it still won’t come together after a few minutes of mixing/kneading, you may have added a little too much flour. Don’t worry it can always be moistened back up with a few tablespoons of cream. You do not need to chill this dough before cutting out your shapes. If you want to do that, you can, but just remember to add a little less flour when you mix it up, because it will become drier as it sits. Roll your dough out to a thickness of about 1/4-inch, between 2 sheets of parchment. Then, use a fluted cutter to cut them out. They’ll bake for 9 to 12 minutes at 375 degrees F.
While they’re baking and cooling, you can make the filling. It’s as easy as mixing the powdered sugar, cream cheese, vanilla, and salt together in a big bowl. Once the cookies are cool, sandwich them with filling and enjoy! They’re a perfect after-school snack, or they’d be great in a packed lunch too. Just don’t forget the milk! In a large mixing bowl, beat the butter and sugar together on medium speed, until smooth (about 1 minute). Scrape the bottom and sides of the bowl with a silicone spatula, and mix in the egg. Add the dark cocoa powder, and mix on low speed to combine. Add the flour, a little at a time, until the dough forms a ball and pulls cleanly away from the sides of the bowl (you might not need all the flour*). Roll out the dough between two sheets of parchment paper, to a thickness of 1/4-inch (rolling pin rings will help you to get an even thickness). Use a 2-inch diameter fluted round cutter to cut shapes, place on the prepared baking sheets, and bake for 9 to 12 minutes or until crisp around the edges and set in the centers. Cool completely, and sandwich with creme filling. In a large mixing bowl, beat the powdered sugar, cream cheese, vanilla, and salt together until smooth. *If the dough seems sticky, add more flour. If it's too crumbly, it can be moistened back up with a few tablespoons of cream. These look so much better than anything store-bought! What a great lunchbox or after school treat! Eu e as crianças vamos adorar sua receita. Estou tão feliz em ouvir isso! Obrigado pelo feedback positivo! YUM!! So so much better than storebought! Absolutley! Just use a gluten-free flour blend that subs 1:1 for regular, all-purpose flour. I’ve got some good recommendations here: https://bakingamoment.com/how-to-stock-your-baking-pantry/. Good luck! I would like snacks or cookies with dark chocolate because I’m a diabetic. I must have dark chocolate treats. Hard to find in stores. Hope this recipe works well for you then! Thanks Rita! My pleasure Anika! So happy you enjoyed. Hey Chetyl- there’s no need. Black cocoa is just another kind of Dutch-processed cocoa powder. I have made these and instead of rolling and cutting, I made two logs, then sliced. Much faster and easier. Great tip Rita! Thanks so much for sharing!